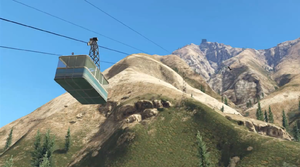 The Aerial Tramway in Grand Theft Auto V.
The Aerial Tramway is a non-drivable tram allowing the player easy access to the upper reaches of Mount Chiliad, which is the tallest point in San Andreas. The aerial tramway costs $10 per trip and a letter scrap can be found in the terminal on Mount Chiliad. This page was last modified on 20 May 2014, at 21:21.